Tiny Tears has been loved by children for generations. 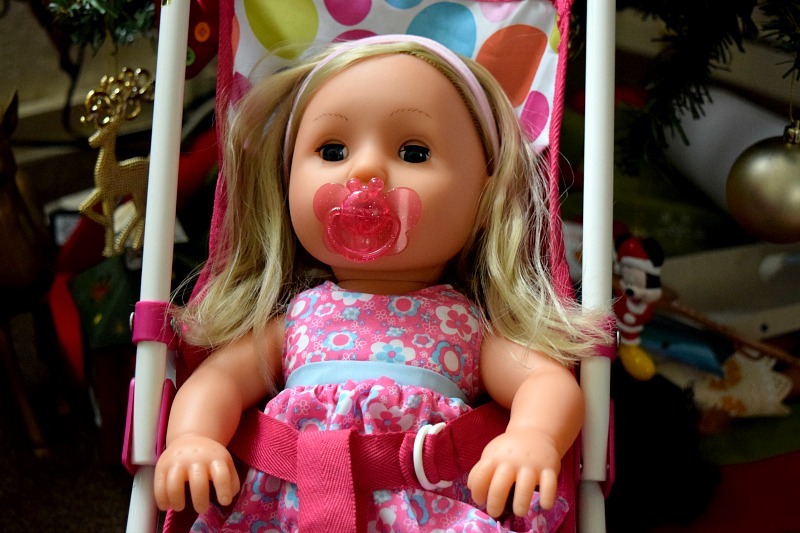 She was the first fully functioning feeding, crying and wetting doll with closing eyes and moveable arms and legs. Last year she celebrated her 50th Anniversary with a special celebrative doll which we reviewed here. This year she has a fresh new look. The Classic Tiny Tears comes with a new outfit. You can still feed her with her water bottle to make her wee on the potty, or sit her up to cry real tears. The Classic Tiny Tears doll comes complete with potty, hairbrush, dummy and a bottle. 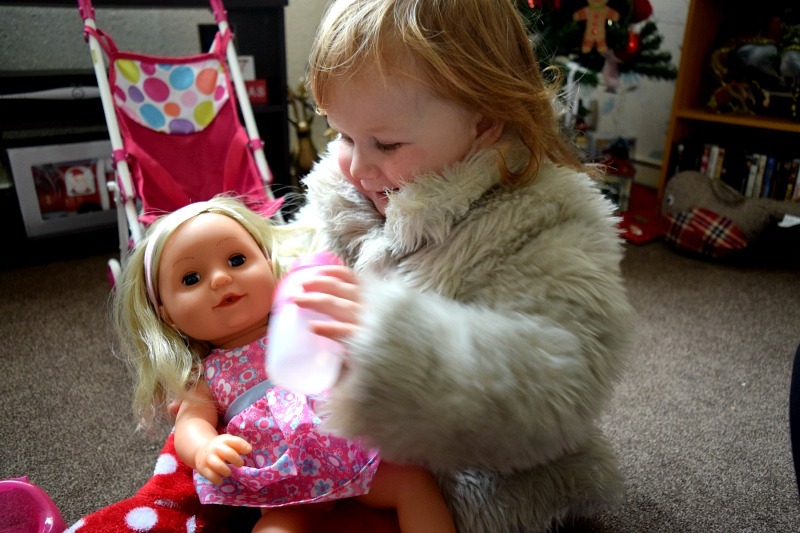 Elsie has been sent the Classic Tiny Tears to review and we also have one to giveaway to one lucky reader at the end of this post! Elsie received Tiny Tears last week and so far has put her down only to sleep. Poor Tiny Tears has been given many a reason to cry thanks to being carried around by her hair or dropped out of the pushchair on the school run. Thankfully she isn't a real baby but she is close enough to the real thing for Elsie to love playing with her 'baba'. She loves her pretty dress and that she can put big girl pants on her. She loves that she goes 'n-nights' when you lie her down and her eyes automatically close. 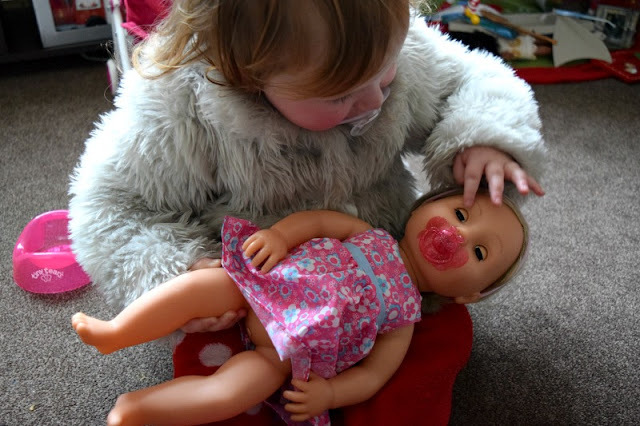 Tiny Tears is a lovely doll with great functions to keep your child interested and enjoying their role as mummy or daddy. She is so unique in comparison to other dolls on the market with the real tears and the beautiful long hair. I haven't yet let Elsie use the wetting feature as she is a nightmare with messy things and I am not ready for that! But it means she will grow with Tiny Tears and eventually discover new ways to play with her. 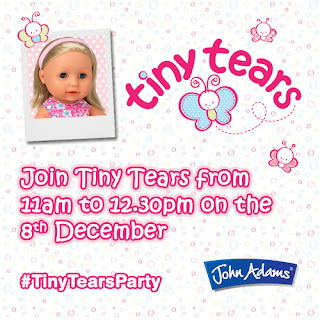 You can find out more about Tiny Tears at www.johnadams.co.uk or you can buy her from Amazon, Argos, Toys R Us or Smyths Toy Superstores. Don't forget to enter the competition below and also join us on Thursday 8th December between 11am and 12.30pm for a fun Twitter party with @JohnAdams_Toys for the #TinyTearsParty for a chance to win some great prizes!